Phonographic Copyright (p) – Warner Records 90 Ltd. Copyright (c) – Warner Records 90 Ltd.
White vinyl limited to 1000 copies. Sold exclusively at the Manchester Art Gallery between 30 June and 3 September 2017 as part of the "True Faith" Manchester International Festival New Order and Joy Division exhibition. Copies could be found for sale in the Gallery shop priced at £35.00. 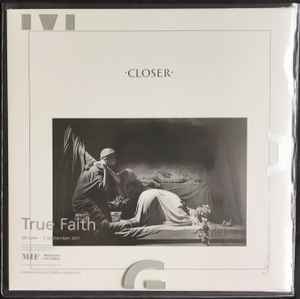 The sealed record is held in a special "True Faith" thick PVC protective sleeve featuring the museum and exhibition logos plus details on the limited edition nature of the pressing. The sticker on the LP cellophane states "cut from the 2007 remasters". ℗ & © 2015 Warner Records 90 Ltd. I went to see the exhibition 20 July 2017 and there were copies left even though it is coming to the end of its run. They are strictly limited to one copy per person. If you are not able to attend the gallery has said they can do mail order by phone so don't give the flippers your hard earned cash. Its also a very good quality pressing and well worth shelling out a little extra for. Gallery exhibition is nice if you are walking by and want to drop in for 10 minutes but is probably not worth a special trip.